The recent IXL "showdown" in Auburn, and a recent American Bottle Auction offering got me to thinking about one of my favorite bitters. The California Wine Bitters brand was offered by at least three different company's and there were trademark infringement lawsuits flying all over the place for awhile in the 1860s. There is even a paper labeled lady's leg with the California Wine Bitters brand! I suppose this name for a bitters drew quite a demand, and several agents and proprietors just assumed the rights to it. The M.Keller continues to be a mysterious bottle even after 50 years of bitters research. My theory is that in an effort to escape legal ramifications, Keller was one of the few Western concerns that actually exported their bitters to the East. This would definitely be in the minority of Western bitters manufacturers doing this, but of the 7 or 8 examples known, only a few have been found in the West. I am 100% convinced that this bottle is Western blown, and each one is a different color with two being a deeper olive with yellow tone. They are such pretty glass, and elaborate in design. As "bittery" as Nevada is, I would be interested to know if even a shard of a Keller has ever been found there. I have not heard of one. I do know that Matthew Keller had a depot in Philly to market these bitters from the Los Angeles vinyards. Regardless of where they were exported, they continue to be extremely rare. SO similar to the Henley's IXL, and with the pushed up base, and mold characteristice of the Western "seamed wines". They also come in the exact colors of these wines so coveted by Western collectors. Someday a Keller with a label will show up. I do have one, but the label does not indicate anything but the brand. Overall this is one of the most misunderstood, and vaguely researched bottles out there. I believe it is one of the most beautiful! That is certainly one of the finest examples of this bitters I have personally seen and I have examined four of these examples, the blue-green one, the yellow-olive one, the lime green one and this pastel green one. 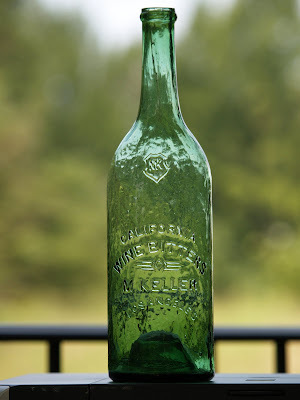 The Keller's Wine Bitters bottle is a product of the Pacific Glass Works, this bottle is shown on page 62 of my book Early Glassworks of California. I was able to enlarge the stereoscopic photo so big that I could make out the outline of the embossing on the surface of the bottle. I have researched this product but do not have sufficient information to write a complete story about this product. In the S.F. Alta Calfiornia paper on September 1st, 1870 they wrote about his display at the State Fair. "M. Keller-176 bottles wines, brandies and bitters; one box of lemons." These bottles also remind me a lot of the large size New Almaden Vichy Waters. Very similar in the color variety, as well. I have owned at various times three of the eight known Keller examples. I've always been doubtful of the "1863 only" date stated in Wilsons book. I wouldnt be a bit surprised if the Kellers are from the late 1860s time frame. The 1863 bottle may have been labeled only, as the labeled example I saw was on an unembossed bottle. In my earlier comment I mis-spoke a bit, I went back and looked at my enlargement and realized that it was the NEW ALMADEN VICHY WATER bottle that I could identify in the photograph. From the research I've done on the Keller's California Wine Bitters, there is not enough evidence to support any particular year of manufacture. I've found advertisements for this product in 1863 through 1870. One of the stongest pieces of evidence came from an article written on his products that were displayed at the State Agricultural Society Fair in 1867; where it was stated "M. Keller, of San Francisco, exhibits eight varieties of wine and two of wine bitters. The bottles used by Keller are of very clear white glass, and the colors of his wines, as seen through the bottles, are very handsome." It would be my opinion that these bottles are late 1860s. We dug a beautiful but broken sparkly apple green one recently that was in a layer containing other pre 1870 post 1866 bottles. No curved leg "Rs" here on this bottle but definitely a glass product of a San Francisco glass works. There is an extremely rare variant of this bottle most collectors aren't aware of. It's a miniature the exact same shape measuring 4-3/8" tall in a brilliant yellow green colored glass embossed with only the shoulder monogram. It's possible that these were a one time distribution given out at only the state fair to promote the product. Great picture M.E. and a real wow of a Western bitters. Thank you for continually sharing such superb killer bottles! Wow! I would love to see the little sample! Also, if this bottle is later 1860s, would it not be right in the same timeframe as the earliest IXL's? Maybe just a year or two earlier at 1865-67? The broken example recently dug is interesting. Any photos of the pieces Lou? Dale M.
The one and only broken Keller I have dug was in the town Of Tehama, south of Red Bluff. A mint one was dug in RB back in the early '80s. They were definitely distributed around the North valley. Yes, your bottle is an EXTREME example of Western "Power". Dang, it's "whittlicious"! Was discussing this bottle at the Los Angeles Club meeting last night and it was mentioned that an early bottle magazine article reported the discovery of a Keller's in a dig in Arizona. I've never heard of any, even pieces, ever being found here in So Cal. Has anyone? The example in the most recent American Bottle Auction may be the same bottle that was dug in Arizona many yrs ago by a Mr Michaels. It found its way to the Elmer Smith bitters collection at some point, and then when that collection was auctioned in 1993, changed hands 2 or 3 more times until the recent auction last month. I have never heard of any pcs coming out of So Cal, and the Az find is the only find in the SouthWest that I am aware of. The example in the most recent ABA appears to be the same one that I bought out of the Elmer Smith Collection. I sold it to Bryan G. and it was sold again when Bryan auctioned his collection in the big three part auction. Three Keller's in that auction if I remember correctly. This former Elmer Smith bottle was rumored to be the one found in Arizona. So, with just eight known examples, does anyone know exactly where they all were found? I'm counting at least four from New England, one from Arizona, that leaves three from California?? Portland?? I havent heard of them surfacing anywhere else, but surely some of the other blog readers may know. Do any of the blog readers know where the example that Doc Ritz had many yrs ago was found? Or the bubbley example that was in the Pat Wilson collection was found? I used to own the Doc Ritz example, and was under the impression it was dug in California somewhere...not sure where. I had forgotten that the Wilson collection in Oregon had a Keller in it. I would assume that since the majority of the better Western bitters in that collection were dug in Oregon,or Washington, it is possible it came from the Portland area, or possibly Vancouver, Wa. Everything else has been found there, so I suppose a Keller would be possible. Wow! In the end I got a weblog from where I can actually obtain useful facts regarding my study and knowledge.